Sick and tired of all that clicking and typing it takes to dial a number in Skype? Give your fingers a break with Dial Directly for Skype, a little utility that allows you to initiate Skype calls by simply pressing a combination of keys. But while it may save your fingers some effort--and may save you the embarrassment of a wrong number--Dial Directly may cost you some time. Clicking one of your hotkey combinations launches Dial Directly for Skype's small window, which asks you to confirm the number you want to dial. 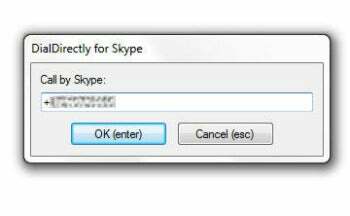 Dial Directly for Skype is offered as shareware: A fully functional version is available without purchasing a license, but it comes with a time delay of a few seconds. You'll have to wait before numbers are dialed and you'll see a notification that you're using it as shareware. You can purchase a one-PC license for $15. Infonautics offers Business licenses for companies with up to 10 PCs for $75, and Corporate Licenses for companies with 11 or more PCs for $135. Once Dial Directly is installed, you can use it to set a series of three hot keys (such as <Ctrl> +< 3> or + , for example) to dial phone numbers in Skype. These can be numbers you find on Web sites or in your contact manager, or just about anywhere. You can set it to dial a number that's been copied to your clipboard, or to prompt you to enter a number, or to redial the last number you've entered. If you want to call a number you find online, you have to copy and paste the number, click the hotkey combination, and Dial Directly will place the call, launching Skype if it's not already running. While Dial Directly is designed to save you time, I found it a bit cumbersome. If I was going to take the time to copy a number and then click the necessary keys, wouldn't it just be easier to add the number to my Skype contact list, so I could call it with a single click in the future? And Skype already offers its own "Click to Call" plug in, which, when installed, highlights all numbers it identifies online, and allows you to place a Skype call with a single click. Skype's Click to Call plug in is free, and much faster to use. While I was occasionally annoyed by the fact that it highlighted every single phone number it identified on the Web--causing me to accidentally place a few Skype calls I hadn't meant to--it was far superior to Dial Directly's solution, which was much slower to operate. Dial Directly for Skype lets you use keyboard shortcuts to initiate Skype calls.